RICHMOND, Va. (January 27, 2015) – The Elite Clubs National League (ECNL) today announced Jennifer Westendorf and Colorado Storm ECNL U15 as the January S’Hero of the Month award recipients for individual and community leadership. These S’Heroes who are role models for our nation’s young female athletes, balancing their drive to become elite athletes with the pressures of fitting in with social peers. Jennifer Westendorf is a member of the GSA ECNL U18 team, and is currently the ECNL goal-scoring leader with 32 goals in 20 games this season. Jen was born in St. Louis, Missouri, where she grew up with her Brazilian mother, Adrianna. She fell in love with the game of soccer at an early age, and quickly found success as a left-footed player with great ball-striking ability. Jen began playing in the ECNL for GSA in Atlanta, committing to a six hour round trip for training and games. The travel demands to play for GSA were significant, and ultimately resulted in a family decision to move to Georgia. Among other things, the family move was made to help facilitate Jen’s goal to play soccer at the hightest level possible, and be the best that she can be. Jen will continue her soccer career at the University of Notre Dame in the fall of 2016. Her and her family’s commitment to excellence, and to overcome obstacles to achieve their goals, define what it means to be an Amazing Young Woman. In November 2014, the Colorado Storm ECNL U15 team was challenged to a club wide charity campaign, the first annual “Storm Strikes Hunger”food drive. In the first year of the club’s food drive competition, the U15s helped raise over 4,000 lbs of food for local charities, including Thornton Food Bank and Food Bank of the Rockies. The Colorado Storm ECNL U15 team not only participated in the food drive, but also volunteered on available weekends at the Food Bank of the Rockies, where the team volunteered multiple times a year. The ECNL U15 team is a living example of the core values of the Colorado Storm Soccer Association (CSSA), using teamwork to aid the community and instilling positive character in the lives they touch. They go above and beyond both on and off the field, raising the bar for the next generation of leaders. 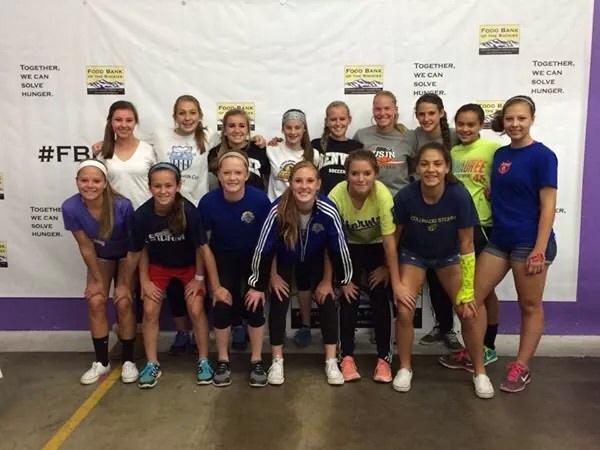 In 2014, the ECNL U15 team went door-to-door to gather used soccer equipment, uniforms, and other gear. What started out as a soccer specific ask, soon turned into a project for all sports, and the team sent all of the donated items to Project Hope in Africa to be distributed to rural schools in need. In the same year, the team also participated in a CSSA auction to raise money for a scholarship fund for low-income players in Coloroado. Whether it is gathering items to send overseas, collecting nonperishable food items for the local food banks, or contributing to the CSSA auction to raise money for the Colorado Storm scholarship fund, the ECNL U15 team is leading the way. They will continue these efforts in the spring when the Colorado Storm launches “Kicks for Cancer”, an initiative inspired by the team to raise money for cancer research. S’Heroes is part of the Amazing Young WomenTM campaign designed to showcase strong, successful women who embody the leadership ideals first learned and developed on the soccer fields of their youth. The ECNL is calling on all who love sports to join them in supporting youth female athletes as they recognize their own potential, define their individual paths to success, and prepare to be our next generation of leaders by visiting www.AmazingYoungWomen.com and using the hashtag #BeautifulAmbition. Studies have shown that driving factors behind girls dropping out of sports include social stigma and limited exposure to the inspirational journeys trailblazed by positive role models. Too often player traits that are so valued by teams are not promoted as “beautiful” traits for young girls. By age 14, girls are dropping out of sports at two times the rate of boys. Amazing Young Women encourages young female athletes to embrace their ambitious, driven and competitive nature. And those recognized as S’Heroes have taken a spirit of leadership and inspiration from the field, and have demonstrated that it’s not just about a phase of your life, but a way of life.